Strawberry Fields Truffles are packed with strawberry flavor. These rich chocolate truffles have both strawberry puree and chunks of real berries inside, resulting in a truffle so flavorful, you'll think you're eating a fresh-picked berry. This recipe calls for freeze-dried strawberries, which are different from regular dried strawberries. They are light and crunchy, and rehydrate in the truffle, turning into moist bits of berry. They can often be found at Trader Joe's grocery stores. If you can't find them they can be omitted, but the truffles will lose a good deal of strawberry flavor. If you are using fresh berries, you can just blend them in a food processor or blender, and strain the puree through a fine mesh strainer to remove any seeds. If you are using frozen berries, place them in a small saucepan over medium heat until they are warm and release their juices, then blend and strain as above. You will need 1/4 cup of strained strawberry puree for this recipe; reserve any extra for another use. Place the chopped chocolate in a large bowl and set aside for now. In a small saucepan, combine 1/4 cup of strawberry puree, the heavy cream, and the corn syrup. Bring this to a boil over medium-high heat, stirring frequently. Pour the hot cream over the chopped chocolate. Let the cream and chocolate sit together and soften for one minute, then gently whisk or stir them together. Once the chocolate is completely melted and smooth, add the room temperature butter and whisk until it's incorporated. Take 3/4 cup of the freeze-dried berries and chop them, then add them to the ganache and stir until they're well-mixed. Reserve the remaining 1/4 cup of berries to use for decoration. Press a layer of cling wrap on top of the ganache and refrigerate the ganache until it is firm enough to scoop, about 2 hours. Once firm, use a small candy scoop or a spoon to roll the ganache into little balls. Dust your palms with cocoa powder, and roll the balls between your palms to get them perfectly round. Place the truffles on a foil or waxed paper-covered baking sheet. Melt the candy coating in the microwave. Using forks or dipping tools, dip a truffle completely in the coating, then tap the fork against the lip of the bowl to remove excess coating. Set the dipped truffle back on the baking sheet and, while the coating is still wet, top it with a piece of freeze-dried strawberry, or other decoration. Repeat until all of the strawberry truffles have been dipped. 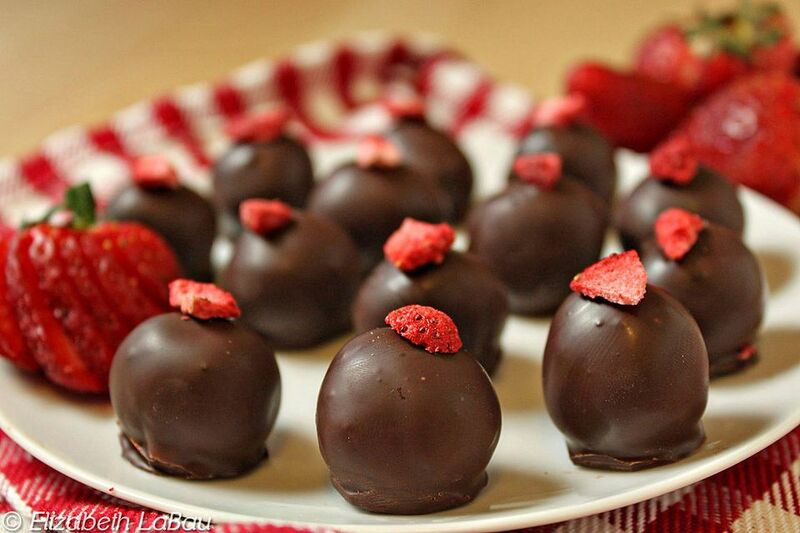 Strawberry Fields Truffles can be kept in an airtight container in the refrigerator for up to a week. For best taste and texture, bring them to room temperature before serving.